Lettergorman in Cork is a five-stone circle, there is a 6th stone lying next to the stone circle, which is a block of white quartz, these stones are often associated with stone circles, quartz in Irish being ‘Grianchloch’, which means ‘sun stone’, and also in this stone circle one of the two portal stones has fallen. The name Lettergorman comes from the Irish ‘Leitir Gormáin’ meaning cornflower/blue bottle hillside, Leitir being Hillside or wet hillside, and gormáin meaning either the plant blue bottle or cornflower. 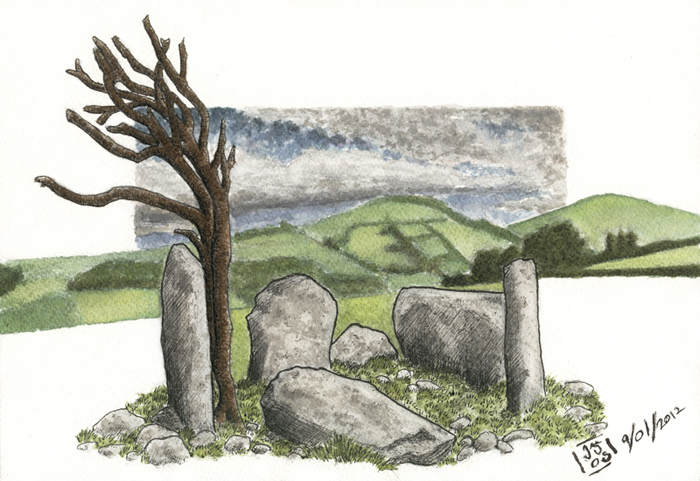 In the 17th and 18th centurty folklore stone circles were seen as petrified dancers who dared dance on a Sunday. This period found the Catholic as well Protestant churches making Sunday an issue to have meriment so throughout Europe you have this story of stone circles being petrified dancers. But in Ireland this is very rare, only found in a small area in the east of the country, which was probably imported from Wales and Cornwall, where this story was much more prevalent. In Britain it has been found that there is a correlation between stone circles and stone axe factories, this is of yet unproven in Ireland. Stone circles near trackways may have been places of acquisition and distribution of stone axes and from there brought to richer settlement areas. In Ireland the main factory of stone axe production was in Antrim, stone axes originating from there have been found in Britain, mostly scotland and throughout Ireland as far south as Lough Gur. The Common orientation of earlier wedge tombs with that of stone circles of a later period shows some continuation of belief between the two, this is further emphasised by the regional distribution of these monuments, suggesting stable settlement patterns over a long period. Many stone circles in Munster only have 5 stones, like the one illustrated here, but can go up to 19 stones, commonly among these southernly stone circles is the axial or recumbent stone, which is usually in the southwestern area of the circle, directly accross the largiest two stones, the portal stones, which mark the entrance, from there the stones decrease in size till the recumbent stone. Thank you JG for this beautiful rendering, full of magic and mystery, of the cromlech and for the information. In the drawing I could find the same emotion I felt when I visited Drombeg.